We’ve all been there. You’re working on a project, and 14 people want to give feedback. You’re writing a press release, and eight people have substantial, sometimes contradictory edits. You’re trying to launch a new project, and far too many people want to put their footprint on your work. Too many people involved. Too many cooks. How do you get most of those cooks out of the kitchen? It’s not easy, but here are several strategies to get back control of your projects, and get them done faster (with your sanity intact). Projects big and small often devolve into tactical debates when the primary objectives aren’t spelled out clearly up front. Why is the project important to begin with? What does success look like? Determining a project’s objectives at the onset can reduce a significant amount of mid-project bickering, and gives you a foundation to point folks back to when their comments go astray. This is perhaps the most important recommendation of the bunch. Too many projects suffer from having too many cooks in the kitchen, because multiple people see themselves as the owner of the project! Even if they’re not directly leading the effort, some people will still feel responsibility for the project’s success or failure. Before work begins, designate one person (yourself, for example) as the project owner. Never assign more than one person as the primary project owner. If there are multiple people who want to be owner, make a clear decision and assign the others as “approvers” (see next tip). You may still have plenty of people interested in your project, but clearly assign the role of “contributor” and “approver” to a few folks before your work begins. This way, even though you may get lots of feedback during the project, you know which people have been pre-designated as relevant enough to provide official feedback, and which smaller group of people (or better yet, a single person) needs to give the official thumbs-up to continue. 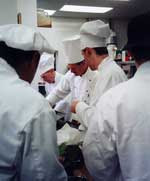 Many potential cooks feel they need to help control the progress and outcome of a project simply because they don’t understand the path from start to finish. If you’re the project owner, give everyone a clear idea not only for what the finish line looks like, but also how you’ll get there. Identify at least 2-3 milestones with check-ins for various constituents to look in at what you’re working on. Even though only the “contributors” and “approvers” can officially provide comments on and modify the project, these check-ins will give a potentially larger group of “cooks” the visibility they need to feel comfortable. Project leaders who want to be seen as collaborators often present a short set of options for key decisions. Problem is, without designating a strong recommendation up-front, you’re giving the room of cooks permission to debate the options in a very unfocused and inefficient manner. As project leader, it’s your responsibility to bring your recommended decision to the table first, backed up with a short set of potential alternatives. Give your team confidence that you’ve considered a wider variety of options, but also make it crystal-clear that you’re putting your weight behind a single option. This will give the “cooks” confidence, and will keep many of them from offering a debate. If you’ve successfully laid out the project objectives up front, then force yourself (and the “cooks”) to manage the project with objectives in mind, not tactics. Don’t let others enter into long debates over how tactical things should be executed. Constantly bring debates back to the end-game, and keep everyone’s eyes on the finish line. Debates over tactics (whether in a room of cooks or with an individual cook) are an easy way to waste time and get your project off-track. Don’t let it happen. Nobody thinks too many cooks is a good idea! This may sound counter intuitive, but it’s true – and it’s a good tip to end on. Even your worst “cooks” intuitively know that “too many cooks in the kitchen” for any given project is a bad thing, and a quick way to waste a lot of people’s time. Up front, and throughout the project, gently remind team members (in a group and individually) that you definitely want to avoid the “too many cooks” effect. Make a joke of it, and refer to past projects that will remind others of the pain involved. This will help get the issue clearly on the table, and will grease the wheels to make many of the above strategies work far better.